The Phi Beta Kappa Society’s 2017 Summer Reading List offers a selection of books that will deepen your love of learning and let you explore a wide range of topics from an illustrated history of controversial philosophers to a Shakespearean troupe clinging to scraps of civilization in a post-apocalyptic world. 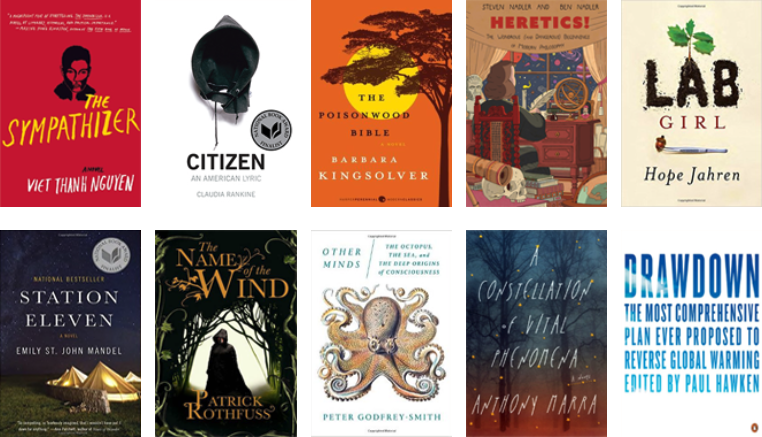 The list (including links and summaries from Goodreads) is a mix of new and classic books chosen by fellow Phi Beta Kappa members via Facebook, and recommendations from our alumni book clubs around the country. The winner of the 2016 Pulitzer Prize for Fiction, The Sympathizer is a blistering exploration of identity and America, a gripping espionage novel, and a powerful story of love and friendship. A suspenseful epic of one family's tragic undoing and remarkable reconstruction over the course of three decades in postcolonial Africa. An illustrated history of the most contentious and controversial philosophers who fundamentally changed the way we look at the world, society, and ourselves. Acclaimed scientist Hope Jahren tells a story about work, love, and the mountains that can be moved when those two things come together. Following a Shakespearean troupe clinging to scraps of civilization in a post-apocalyptic world, Station Eleven tells a story about the relationships that sustain us, the ephemeral nature of fame, and the beauty of the world as we know it. A high-action story written with a poet's hand, The Name of the Wind is the tale of the magically gifted young man who grows to be the most notorious wizard his world has ever seen. A leading philosopher of science and a scuba diver, Godfrey-Smith brings his parallel careers together in this books to tell a bold new story of how nature became aware of itself. In war-torn Chechnya, an intricate pattern of connections weaves together the pasts of three unlikely companions and unexpectedly decides their fate. A thrilling exploration of death, grief, the powers of good and evil, the novel follows Abraham Lincoln after the death of his eleven year old son, Willie, at the dawn of the Civil War. A cultural history of Chicago at midcentury, with its incredible mix of architects, politicians, musicians, writers, entrepreneurs, and actors who helped shape modern America. Based on years of embedded fieldwork and painstakingly gathered data, this masterful book transforms our understanding of extreme poverty and economic exploitation while providing fresh ideas for solving a devastating, uniquely American problem. Suspenseful and sardonic, narrated in a voice that takes in the symphonic range of the American language, black and white, Invisible Man is one of the most audacious and dazzling novels of our century. From a former Marine and Yale Law School Graduate, a poignant account of growing up in a poor Appalachian town, that offers a broader, probing look at the struggles of America’s white working class. From new U.S. Poet Laureate and Pulitzer Prize winner Tracy K. Smith, a deeply moving memoir that explores coming-of-age and the meaning of home against a complex backdrop of race, faith, and the unbreakable bond between a mother and daughter. A cautionary tale about genetic engineering, the novel tells the story of the collapse of an amusement park showcasing genetically recreated dinosaurs. The story of two competing youth gangs in Oklahoma whose rivalry turns deadly, The Outsiders is a dramatic and enduring work of fiction. Looking for more recommendations? Why not visit The American Scholar or Key Reporter, or check out last year's list!